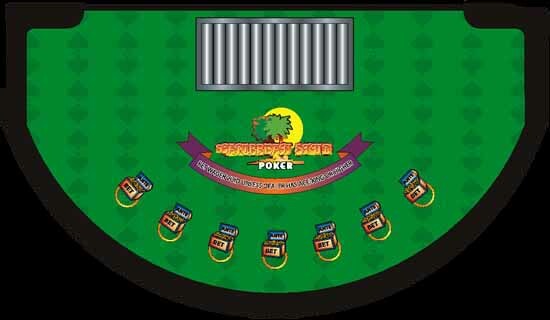 Caribbean Stud Poker is a 5-card poker game played with a single deck of 52 cards, where you play against the Dealer. You place an Ante (initial bet), receive a hand, and decide whether you would like to bet against the Dealer's hand. One of the Dealer's cards is dealt face up so your decision will have to be made on the card showing and the strength of your 5-card poker hand. At this point, you may believe that you can't beat the Dealer and you can simply fold. If you fold, you forfeit your Ante. To bet against the Dealer, you must double your Ante (click "Raise"). To win, you must not only beat the Dealer's hand but the Dealer must also "qualify." The Dealer qualifies by getting any hand containing an Ace and a King or better (e.g. Pairs, etc). If the Dealer does not qualify, you are paid 1 to 1 on your Ante and your "Raise" is returned to you as a push. If your hand beats the Dealer's hand and the Dealer qualifies, you're paid on the Ante and your Raise. The payoff of the Ante is 1 to 1. The payout on your bet will be determined by the quality of your hand (see Payouts below for more details). If the Dealer beats your hand, you lose both your Ante and your bet. In the event that you and the Dealer have the same hand, the next highest card (kicker) determines the winner. Ante - The Player has a higher 5-card poker hand than the Dealers. If the Player Raises and the Dealer does not qualify. Raise - The Player has a higher 5-card poker hand and the Dealer has a minimum of an Ace/King. Progressive - If the Player places $1 in the Jackpot slot, the Player receives a flush or higher. The Dealer qualifies and has a higher 5-card poker hand.